Prominent Republicans are hoping to succeed U.S. Rep. Joe Heck in the 3rd Congressional District. But the competitive district won’t hand the GOP winner of the June 14 primary an easy path to victory in November. 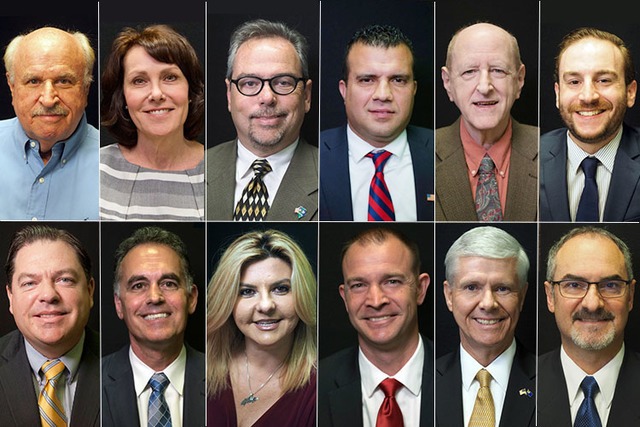 Thirteen Republican and Democratic candidates are squaring off in the June 14 primary, all angling for the nomination and a chance to advance to the November general election and replace Heck. Heck is running for the U.S. Senate seat of Democratic Leader Harry Reid, who is retiring. Winning the 3rd District will be a challenge for the Republicans and Democrats alike. Voter registration is nearly evenly split. The district has 131,904 registered Democrats and 127,554 registered Republicans. Another 88,027 voters are nonpartisan or third party. The GOP candidate pool includes Michael Roberson, Nevada Senate majority leader; Michele Fiore, an assemblywoman famous for her support of the Second Amendment; and Danny Tarkanian, the son of the late UNLV basketball coach Jerry Tarkanian. Other candidates are Kerry Bowers, Sami Khal, Andy Matthews and Annette Teijeiro. Bowers, a retired Air Force officer, said he only wants to serve a couple of terms and isn’t accepting outside donations. “I’m basically pledging to the people I will not have anybody’s outside influence,” Bowers said. His goal is to “restore America’s blessings.” His proposals include eliminating federal income, payroll and corporate taxes and replace them with a retail sales tax that has a family consumption allowance to offset the regressive effect of sales tax. Fiore, a two-term state assemblywoman, said she has a proven record. That record includes opposing tax increases, including the $1.5 billion tax package that the Nevada Legislature passed in 2015. The tax package, aimed at public education reforms, was supported by Roberson. It’s been called the biggest tax increase in state history. She said one of her priorities is justice reform, particularly as it relates to people accused or convicted of nonviolent crimes who are driving up the costs of incarceration. As an assemblywoman, she unsuccessfully tried to get a bill through that would make it easier for felons convicted of nonviolent offenses to own firearms and vote. Khal said Congress needs people with practical skills and common sense, saying government is too invasive. He said he could put his business-management experience to use. Khal said he’s a Christian American who immigrated from Syria with his family when he was 3 years old from a 1,000-year-old Christian village in that nation. The federal government needs to get its fiscal house in order and bring down the tax burden, he said. His record at NPRI demonstrates his independence, he said, pointing out that the organization disagrees with Republican lawmakers about issues such as tax increases. “We were never part of the go-along-to-get-along crowd,” he said. Roberson was elected to the state Senate in 2010 and became majority leader after the 2014 elections. Roberson said his priorities include national security, working closely with allies, and easing the regulations that burden businesses. “I want to bring that ability to get things done to Washington,” he said. Roberson defends his record and points to his accomplishments. Of the tax increase, he said it only affects companies that make at least $4 million a year. It also applies to out-of-state companies that sell goods in Nevada, he said. “I think it’s important to expand the tax base in a way that leveled the playing field for small businesses,” he said. Roberson also pointed out he supported efforts to slash the state budget by more than $500 million during the recession. Tarkanian is no stranger to the campaign trail, but he hasn’t been elected yet. He has made runs for offices such as state Senate in 2004, secretary of state in 2006, U.S. Senate in 2010 and the 4th Congressional District in 2012. Tarkanian has the advantage of name recognition. He criticizes the Legislature and Roberson in particular for passing the tax increase in 2015, despite Republicans having control of both chambers of the statehouse. Teijeiro, who has previously run in the 1st Congressional District, said her background gives her an understanding of the challenges residents face. She came from a low-income family — her father came to the U.S. from Cuba and her mother is Puerto Rican. A bilingual Latino, Teijeiro is also a medical doctor. She said she would bring an independent voice to Congress. “Americans are tired of people being bought and paid for before they are elected and that is a huge difference that I have because I will not take money from someone who’s going to be asking me to vote for things that are not in the best interest of people that are not in the district,” she said. The six Democratic candidates are Barry Michaels, Jacky Rosen, Jesse Sbaih, Steven Schiffman, Alex Channing Singer and Neil Waite. None has served in elected office. Michaels has been a candidate for the 3rd Congressional District seat dating back to 2006. He’s upfront about his 1997 federal conviction for securities fraud. He spent 15 months in a prison camp. “I’m not looking for a career, and I’m not afraid to put people on the spot,” he said. His concerns include finding a better way to fight the drug war with taxes and regulations, saying the current method of cracking down isn’t working. Rosen, running for the first time, has the support of Reid. She said her priorities include advocating to protect and preserve what senior citizens have, such as Social Security and Medicare; equal pay for equal work; and affordable college. “I think what it needs to be is accessible and affordable,” she said of higher education. Rosen also wants to see more opportunities for the solar and renewable energy industries to grow and spur the economy while helping the environment. In Henderson, she’s president of Congregation Ner Tamid, a volunteer post. Sbaih’s parents immigrated to the U.S. from Jordan when he was a boy. At age 12, he took a job as a dishwasher at an Italian restaurant to help his family. Sbaih said he wants to see more jobs created, the minimum wage increased to $15 an hour, and affordable college. “They make minimum wage and they cannot put a roof over their heads,” he said. He added it’s important to bring clean energy jobs to Nevada. Schiffman has had a long career that includes working for the U.S. Agency for International Development and the United Nations Development Program, where he has done foreign service work in Iraq, Israel, Kosovo and Afghanistan. His foreign affairs work, which requires consensus building, is good preparation for the skills a congressman needs, he said. Schiffman describes himself as a pragmatic, independent Democrat who is willing to seek out solutions. “It’s important to be a leader, to have statesmanship,” he said. A congressman needs to be an advocate who can help community organizations access the funding and resources they need, Schiffman said. Singer said he wants to see the minimum wage increased to $15 an hour and expand the social safety net for programs such as Social Security, Medicaid and Medicare. Singer contracted an auto-immune disorder at the age of 25. That condition, which requires medication that would cost $1,250 a month without insurance, showed him the need for a safety net. “We do have vulnerable people in our society that need a little help,” he said. When he’s not campaigning, Singer attends the College of Southern Nevada, where he’s studying political science. Waite said he’s focusing all of his efforts toward the campaign. His priorities include campaign finance reform, including eliminating dark money and changing how political action committees operate. “If you’re a PAC, and you attack a candidate, you should offer that candidate an opportunity to respond,” he said. He said any bipartisan efforts that come out of Congress are rare, unusual events and that should be the norm — not the exception. The winners of the June 14 primary will be on the November ballot. So will independent candidate David Scott Goossen and Independent American candidate Warren Markowitz.